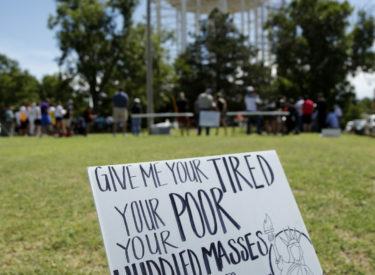 DODGE CITY, Kan. (AP) – Quiet reflection, not bullhorns and chants, was seen at a rally to protest the Trump administration’s immigration policies in southwestern Kansas. About 100 people turned out Saturday for a rally in Dodge City, Kansas. Sponsored by the local Catholic Church, the rally felt more like a Mass than a protest. Some people held signs with messages that read, “Children belong with families not it cages,” and that included verses from a famous poem that appears on a plaque at the Statue of Liberty. The rally was among hundreds across the U.S. urging the Trump administration to reunite families separated at the U.S.-Mexico border.